Kolejny film w cyklu "Kino za piątkę" to opowieść Jima Jarmusha o Iggym Poppie i niepokornych The Stooges. The next movie in our series „Kino za piątkę” is a Jim Jarmush story about Iggy Pop and defiant The Stooges. Jim Jarmusch, creator of Broken Flowers and Paterson, makes a tribute to the legendary group The Stooges and its leader Iggy Pop. Gimme Danger, steeped with punk energy, is not a fancy card. Iggy Pop and the musicians from The Stooges tell Jarmusch the stories of their ups and downs, the shines and shadows of dangerous life, and also mention the greatest provocations. The leitmotif of the film is the search for freedom and creative independence. The film includes fragments of their unforgettable concerts and the biggest hits, such as "No Fun" or immortal "I Wanna Be Your Dog". 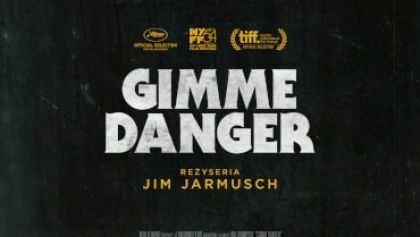 Like The Stooges and their music, "Gimme Danger" is a bit crazy, chaotic, full of emotions, funny, primitive and yet sophisticated in the most uncouth way.